YouTube Releases 'Super Chat' Live-Stream Payment Option - The Next Step for Live? While Facebook Live and Periscope dominate the live-stream discussion, YouTube has also been advancing their live-stream capacity, with new tools and features designed to maintain the platform's position as the number one online destination for video content. And today, YouTube has announced a new tool which could be the start of the next big live-stream trend - at least, if trends in other regions are anything to go by. That new tool is called 'Super Chat' which enables live-stream viewers to pay to have their comment featured more prominently in a chat stream. "Anybody watching a live stream can purchase a Super Chat: a highlighted message in the chat stream that stands out from the crowd to get even more of your favorite creator's attention. And Super Chats remain pinned to the top of chat for up to 5 hours, giving more airtime for your messages." Here's another GIF, this one showing the process of posting a Super Chat in a more detail. As you can see, using the comment field, you'll be able to also tap on a $ icon which enables you to fund your comment. When you do this, there's also a timer added to your comment which shows how long your comment will remain pinned at the top of the chat. "The color of your Super Chat, the period of time it stays pinned in the ticker, and the maximum message length are determined by the amount of your purchase." 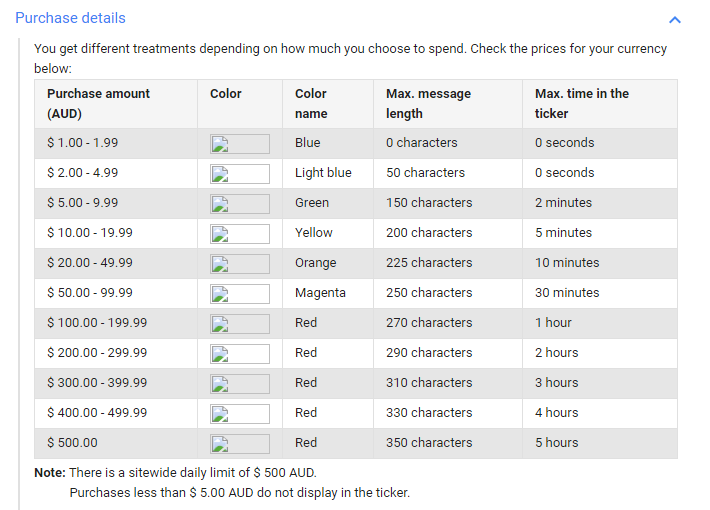 You use the slider to allocate how much you want to spend on your comment, post, and there it is. Payments are currently available on Android (but not iOS), and are facilitated through a connected credit card. So how much will it cost you to have your comment pinned? YouTube's provided a breakdown of the cost structure. So your light blues are your cheapskates and your reds are your super fans. The option gives creators a way to directly monetize their audience, and will replace YouTube's previous voluntary payments tool, 'Fan Funding'. YouTube says Super Chats will also help keep the conversations and connections 'meaningful and lively', and it could also mean we see more live-streamers using the practice as a key income source - essentially becoming the next 'YouTube stars'. But will audiences warm to paying for comments in streams? Actually, the introduction of live-stream payments has already proven successful in other regions - in China, for example, where live-streaming has taken off in a big way, viewers send 'digital gifts' to broadcasters to show their appreciation. "For example, let's say you send a broadcaster a digital sticker of a sports car (a luxury sticker, usually costing over $30 apiece) and then immediately afterwards ask him or her to sing your favorite song. If the broadcaster feels up for it, he or she will thank you for the gift and honor your request - all in the public chatroom that other viewers are also watching from." 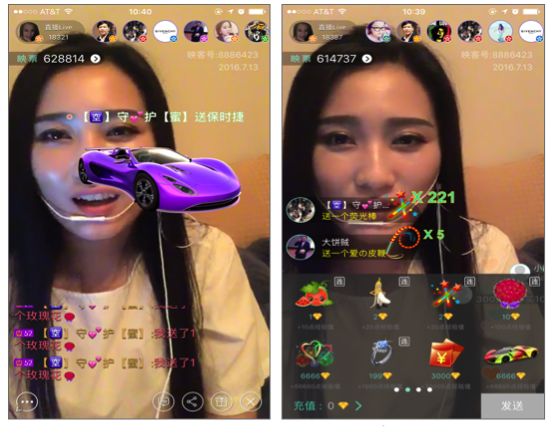 Chinese live-stream platforms - of which there are now more than 150 - have also gamified this practice by rewarding viewers with status titles based on how much they spend on these virtual gifts for the hosts. "On [live-streaming platform] Qiqi, fans are labeled based on how much they give, with $7.50 conferring the title "Rich Man." The labels progress all the way up to "Divine Emperor," at $750,000." This provides additional incentive for viewers to donate money which, in-turn, keeps the broadcasters coming back, fueling a new live-stream eco-system, with revenue split between the app store, the broadcaster and the platform. And while the practice of gift-giving is more engrained in Chinese culture than it is in the west, more platforms have been looking to integrate such tools. 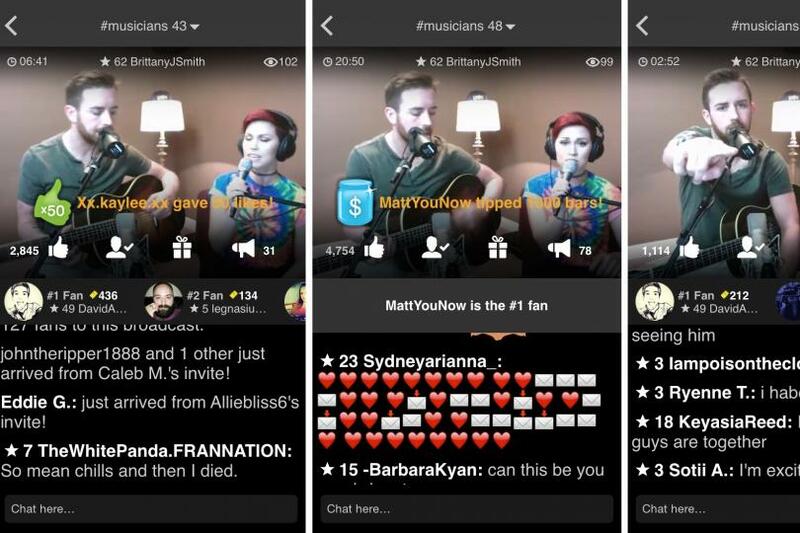 Both YouNow and Twitch already have donation options which, in YouNow's case, enables a sort of digital busking option for artists. On Twitch, they've added an option called 'Cheering' which, as explained by The Verge, enables commenters to "purchase animated chat emotes with real money, with broadcasters earning a share of revenue". It's unclear from today's announcement exactly how YouTube will structure their Super Chat payments, in terms of how much goes back to the creators, but it makes sense for them to incentivize streamers to use their service more often - and providing a direct revenue stream for live is something not currently on offer through either Facebook Live or Periscope. At least, that is, not yet. Last August, we reported that Facebook actually has this functionality already built into the back-end of Facebook Live, with a 'Broadcast Tipjar' option identified within the operating code. And given the option's popularity in other regions, it seems like it's a no brainer that it'll eventually be added to Live - in an interview last year, former Facebook Live head Vadim Lavrusik noted that it seems like a logical path to take, particularly considering its success in other markets. So while it's YouTube who've taken the first step here, it likely won't be long before we see similar in Facebook Live - and now that it's been released by YouTube, and Facebook wants to have everyone broadcasting on their platform, you can bet they'll be looking to accelerate their plans on this front and release such a tool soon. There is a question, however, around how YouTube is using the option in difference to other providers. With Super Chat, YouTuber's will be able to amplify written messages, which is great for fans as intended, but it also gives trolls the opportunity to get more attention for their negative comments. On the other platforms mentioned, they've eliminated this as an issue by only allowing you to fund emoji or make payments without attaching a message to them. YouTube says that broadcasters can use the existing moderation tools to blacklist certain words or ban users, but given recent criticism of Facebook over the content they are broadcasting on Live - including just today, reports of a young girl committing suicide on a stream - they'll likely want to avoid any further potential controversies, which could see them opt for an emoji funding model, as opposed to amping up comments. But either way, this could be a new way forward for live-streaming, a way to boost quality broadcasters, helping to amplify their voices and lifting the overall quality of the content on offer. But then again, maybe it'll just see more strip shows and adult content added, giving the platforms a whole new set of headaches to deal with as they look to boost live-streaming to the next level. YouTube's Super Chat beta is being launched today with selected creators, with plans to launch more broadly on January 31 "for creators in 20 countries and viewers in more than 40 countries".